It was like something out of a Ruth Rendell novel. Or perhaps, being in New York, out of a Patricia Highsmith novel. The take-out leftovers were piling up in my kitchen. Bits of quesadillas, beef sandwiches, rice-puddings liquefied and bleeding into half eaten bagels. Revolting. The pile grew higher and higher. It was the Labor Day weekend, and all my good friends were out of town, interstate, or in Australia. I was very ill with severe bronchitis and just had to wait it out. I was existing on food I had ordered in. I couldn't even make it to the compacter room to throw out the mounting pile of garbage. I emailed my kids, telling them where my will was, and about sundry bank accounts. I was as cold as ice. When I went to the bathroom I took my cell phone with me, worried should I pass out. And also in the misguided hope that someone in New York would call. Silence. I lived like that for five whole days and nights - not seeing a living soul. But thanks to email and Facebook I was not completely incommunicado. Thank you A, E, J and B. You helped me pull through. And of course thank you to the "Seamless" app, and to the delivery guys who brought me my food. It made me wonder. What was I doing here in the Big Apple? When the chips are down, well - the chips are down. But of course it is not all bad, and this week I smiled, as I was riding the Q60 bus home from work. on the 13th anniversary of 9-11. As the bus was crossing the Ed Koch Bridge I looked out to my left at our Freedom Tower. The way the setting sun struck it, it seemed as if something was sticking out if it. "Look," I interrupted my companion who was in full-flight talking about his day, "there is something sticking out of the Freedom Tower!" He glanced briefly across the river. "Oh don't worry about it," he answered before continuing with his New York style monologue. "It is probably just a plane." I just love the New York humor. The five horrible days forgotten, I posted on Facebook about it. 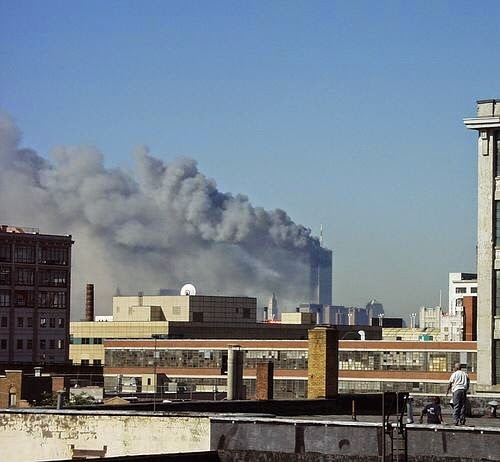 And also this photo on the left, taken from my office window on 9-11. Now one would think - me being a New Yorker and all - that would be that. And it was, for a while. "I didn't realize you were so close," commented one friend. "Wow!" said another. But then came what I should have expected - the anti-American crap. "What about Allende and Chile? They had a 9-11 too." As my good friend A replied, "To bring up another event is like going to someone's funeral and going on and on about another death. Just not done in polite company". Those PC people. Blinkered. It's like you can't say anything about radical Muslims without the bleating of, "There are bad Jews and Christians as well." Oh sure! Whatever. We all know that not all Muslims are terrorists. But it just so happens, that most 21st century terrorists are Muslim. And in any case I had not even mentioned Muslims - just posted about it being 9-11. But the mere mention of 9-11 is enough to set some people off. Dredging up the past. Going back over a thousand years to minimize an event that affected me and millions of other New Yorkers. On and on. You even get, "What about the Crusades?" Seriously? What about them? Let's dredge up Robin Hood? Or Tutankhamen? Yeah, what about Chile forty years ago, and the Crusades nearly a thousand years ago? And yes, Israelis shouldn't throw Palestinians and out of their homes on the West Bank. And the British killed the aborigines in Tasmania. And the mid nineteenth century potato famine in Ireland. My god! But none of this has anything to do with the slaughter of my fellow countrymen in my city on 9-11-2001.